Although we can offer guidance at every stage, it is important to take stock of your SEO at every stage of a project, this interactive checklist will help you to review your successes and address any steps you may have missed. 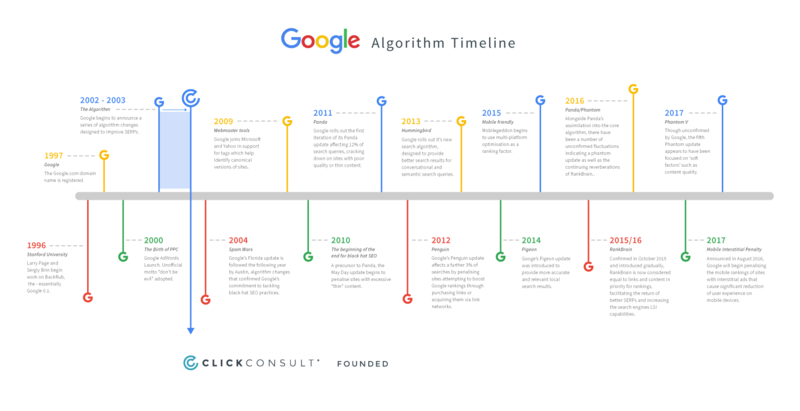 Whether you’re simply curious about the evolution of the Google Algorithm or looking specifically to match an update to a drop in traffic, this offers an explanation of the evolution of the algorithm. Sometimes the hardest part of a new industry or practice is getting to know its language and terminology. With this SEO Glossary we attempt to demystify industry language and offer useful, informative definitions of key terms. You can’t climb ahead of your rivals on the SERPs unless you know where you sit in the marketplace. Find out how to gather valuable data on factors affecting your own and your competitors’ search visibility. Having high quality links pointing to your website is an important part of its search engine ranking success. Here’s how to building these inbound links using outreach. With this beginner’s guide we look to give you everything you need to establish data-driven strategies for any SEO campaign, including how to develop keyword strategies and how to choose and analyse your data. Now that mobile searches surpass those on desktop, you need these ten tips to succeed in the age of mobile marketing and mobile SEO. A simple guide to recovering from Google’s manual penalties and algorithmic updates, and driving your website up to a strong, profitable position in Google’s search engine rankings. Google Analytics can seem intimidating at first, yet it is a vital part of any successful ecommerce endeavour. In order to help overcome the first hurdle in achieving actionable visibility we are providing a custom dashboard for your ecommerce efforts. Though having visibility as the money rolls in is important, the lead generation dashboard allows you to track another form of organic conversion – whether this is queries or quote requests, this dashboard will help you keep track of your best performing forms.